Only the best value wines anywhere on earth and some of the best high quality wines too. Michael Mondavi who imports her wine to North America, Decanter Magazine, United Nations, The Wine Advocate, Robert Parker and others. Recently, I had the opportunity to taste 4 of Susana Balbo’s recent releases. They are all available at Felipe Motta Wine Store in Coronado and they are all of excellent quality and superb values. 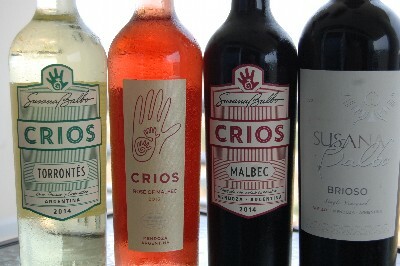 Three of the wines belong to the Crios line which Susana has created for her 2 children to produce. Crios means “offspring”. Susana now concentrates on her higher end wines. By the way, she was the first female winemaker in Argentina. Talk about breaking the mold of the “old boys club”. 2012 Susana Balbo Briosa (single vineyard) $33.25, 14% alc.